Alright people! Back to summer styling for a little bit. I know the Anniversary Sale was A LOT – a lot of posts, a lot of really early fall content, but I hope you found some great things in the sale you’ll be able to use all season long and into the next few years I’m really happy with what I ended up keeping! 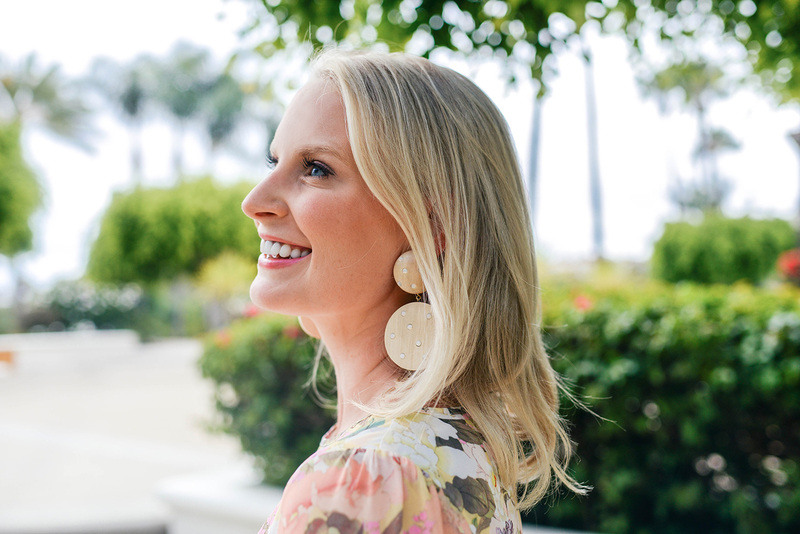 With the Nordstrom Sale ending last night, we’re now moving back to my outfits from my recent trip to California… and boy, are they summer perfect! I first purchased this dress a couple months back as an option to wear to a wedding in June, but decided to go with this gold dress instead. I actually have another wedding coming up this weekend, and think I’ll be taking this to either wear to the rehearsal dinner or wedding – I haven’t decided yet! What I do love about it is it’s just long enough on me to wear with flat sandals… which means I’m not towering over everyone and I can be truly comfortable all night long. It’s a very lightweight piece, making it ideal for an August wedding in Houston too! I fell head over heels for the beautiful floral print in yellow, pink, lavender, green and white. It’s such a dream! If these aren’t your colors though, this dress comes in TEN other floral prints!! This little minidress is a cute option to wear day-to-night while you’re traveling this summer! Pair with sneakers during the day and dress it up with heels at night! 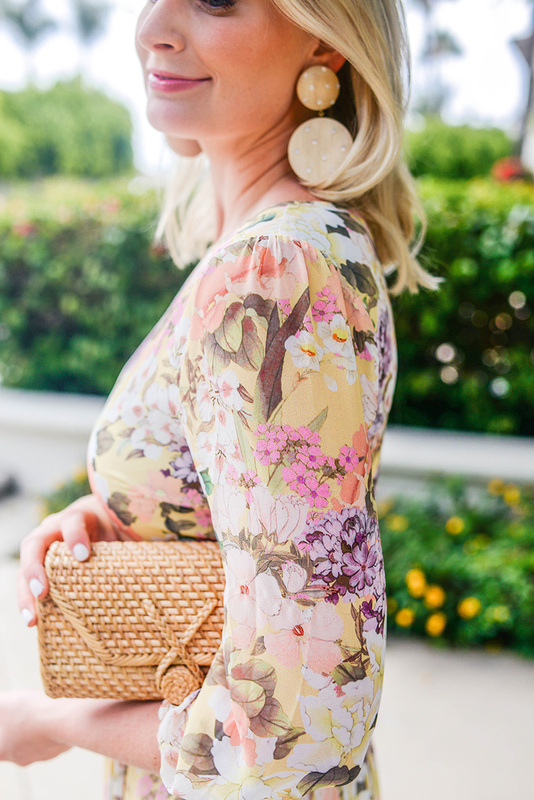 This one-shoulder floral mini would be a great dress to have on hand for summer date nights, or dress up with fancy accessories for a wedding! If you’re a bride to be, I love the idea of getting ready in this little romper and matching robe. So gorgeous! The next pair of pajamas I’m going to buy is right here. I would love it if she made that print into a gown or cocktail dress! The print I’m wearing also comes in this dress style, this skirt, this top and this other dress! This one-shoulder blouse looks like the perfect going out top for fall! It’s on final sale for only $73! If you’re looking for a simple black jumpsuit, don’t miss this one. This swiss dot dress in navy is such a chic find for fall/winter. Wear bare-legged while the temps are still warm, then pair with black leggings and boots come cold weather! Looking for a good fall wedding floral? Don’t miss this. 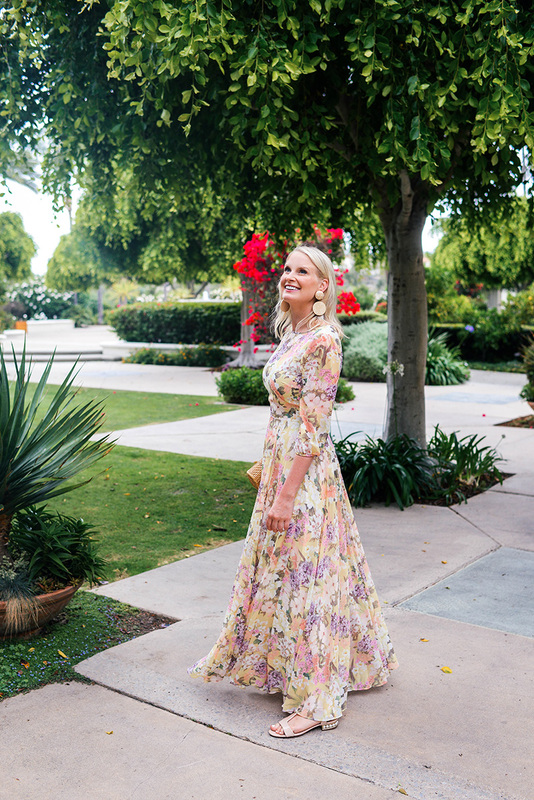 This floral dress is stunning!